I'm using the Date Reservation Widget. 1) I indicate NO weekend reservations. But when I click on a Friday... the weekend dates appear again. 2) Also, the data is not being sent via email. It just has the time slot reserved but NOT the actual day of the week or month. We are very sorry for the inconvenience. I can reproduce the bug with the Date Reservation widget allowing weekends to be selected even when weekends are disabled in the preferences. 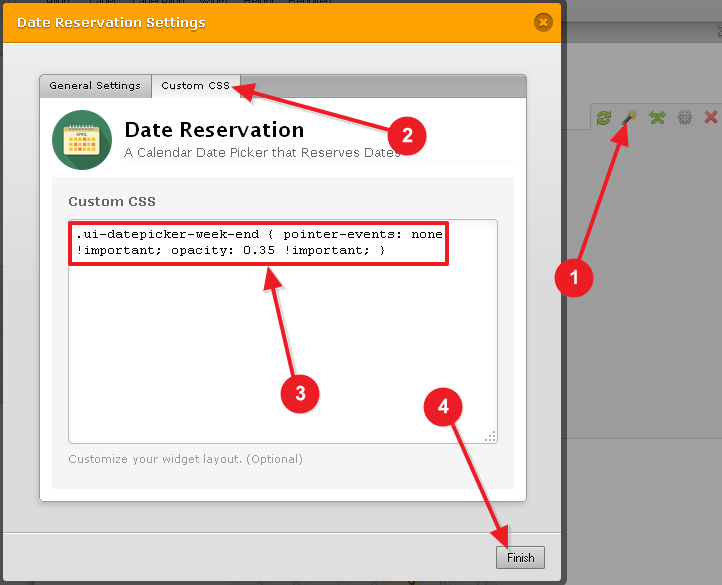 After adding this to each of your Date Reservation widgets, the CSS code in them will be preventing your users from ever selecting the weekend dates in these widgets. I have also forwarded this thread to our developers, so that we can fix this option in the widget - so that there will be no need for using Custom CSS in the future. We will let you know through this thread when this bug is fixed. Thank you. We will be supporting you with that issue there, shortly. You are most welcome, I am happy that the offered workaround was able to resolve the issue for you right away. We will also let you know when this is properly fixed on our back-end by our developers. The weekend setting is fixed and should work as expected. Please check it out - thank you.